On the August Bank Holiday in 1963, London’s busy Oxford Circus and the surrounding streets were closed off. The streets were empty of weekend shoppers and all traffic. In their place a team of engineers and construction workers take over. Working meticulously to a detailed plan they build a raised platform, lifting the Circus a metre. 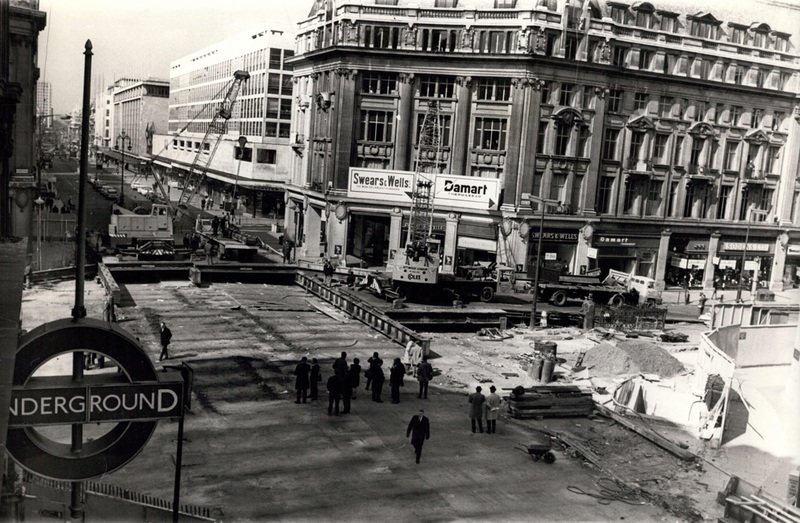 Within sixty-five hours they complete the ‘Oxford Circus Umbrella’, the raised platform and four ramps from each of the road approaches to the junction. The Bank Holiday weekend effort was part of Operation Umbrella: the scheme to add the Victoria Line to Oxford Circus station just below the junction, whilst keeping one of London’s busiest stations and junctions moving. The construction of the Victoria line ‘was one of the most difficult and complex engineering projects ever undertaken’ says the book The Victoria Line: A Pictorial Record published by London Transport for the line’s official opening by Queen Elizabeth II on 7 March 1969. Specifically, the greatest challenge was building the elements close to the surface: where stations with spacious ticket halls and tangential escalator shafts had to be dug. London’s subsurface was congested: a warren of utility services and building foundations. Another challenge was minimising the impact of the construction on rail services and road traffic. The ambition with the Victoria line was to connect the disparate patchwork of Underground lines London Transport had inherited into a connected network. All Victoria line stations (bar Pimlico, which was a late addition to the route) would offer interchanges to existing Underground or main line rail services. This meant construction would take place close to existing rail tunnels and at busy road traffic intersections. At five key stations, the new platforms were to be same-level interchanges, such as the parallel northbound platforms on the Bakerloo and Victoria line at Oxford Circus. This station design feature was to ease interchanging, reduce passenger movements through stations and ease rush hour traffic. However, creating same level interchanges was complicated: rail services had to be diverted and platforms relocated so that northbound or southbound services of two London Underground Lines could be matched. The Victoria Line was the first line to be built in 50 years. Plans for Underground network expansion lay dormant for years during the Second World War and the rebuilding efforts afterwards. The new line from Walthamstow to Victoria received Parliamentary approval in 1955, but it was not until August 1962 that central government authorised construction of the line to start. The extension to Brixton was approved in August 1967. “The complex task of creating a new tube railway has to be carefully planned so that the engineering works were carried out with the least possible interruption to existing Underground services and with minimum disturbance to properties, the public and road traffic“ a leaflet from 1969 informing passengers of the new Victoria Line reads. 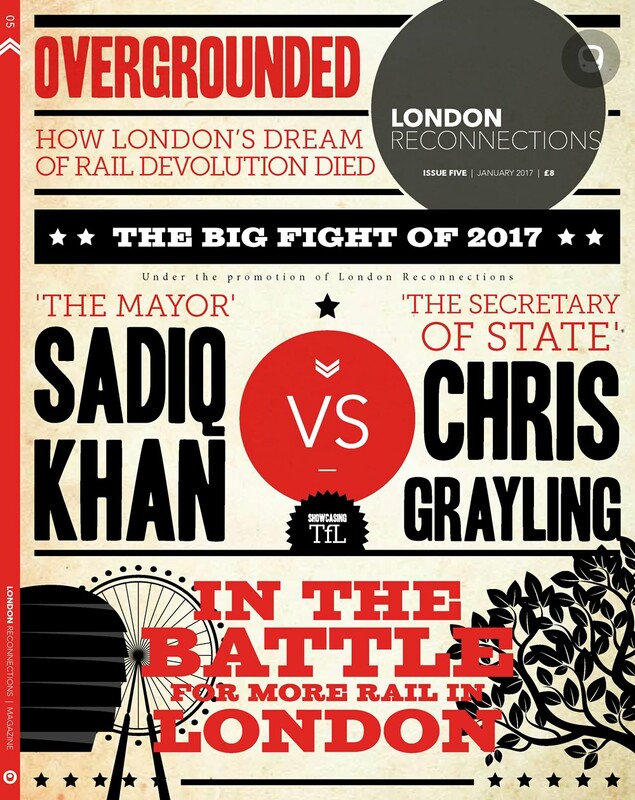 The nearly seven years between Parliamentary approval and building work starting gave London Transport the chance to methodically plan the engineering works. In particular, how to create same-level interchanges between different lines at the stations. The footprints at existing stations had to be enlarged or altered to make the extensive interchange network possible. Despite detailed planning and efforts to minimise the construction duration, it took over six years to build the 17km route from Victoria to Walthamstow. Construction of the line included many difficult elements such as complicated station redesign and route diversion to accommodate same-level interchanges. However, it was the complexity of the work at Oxford Circus that limited the pace of construction in Central London. Although the first contract let following the government’s go-ahead on the Victoria line was for Oxford Circus station, the station was also the last major work to be completed. Until 1963 work on ‘one of the most complicated engineering projects London has ever known’ (as a station leaflet from 1968 described the Victoria line) had mostly gone unseen by the public, deep below ground. Exploratory work beneath the existing Oxford Circus station began in September 1962 to establish the position of water mains, pipes and other utilities. The reconstruction of Oxford Circus station exemplifies many of the challenges civil engineers still face when carving stations out of London’s congested underground. It was certainly the biggest station reconstruction as part of building the line. The design included a new ticket hall directly beneath Oxford Circus junction, new sets of escalators to the intermediate and then low concourses as well as new platforms and interchange passageways. To make things even harder, Oxford Circus was one of London Underground’s busiest stations – then as it still is today. Above ground Oxford Circus was also one of the city’s busiest junctions. 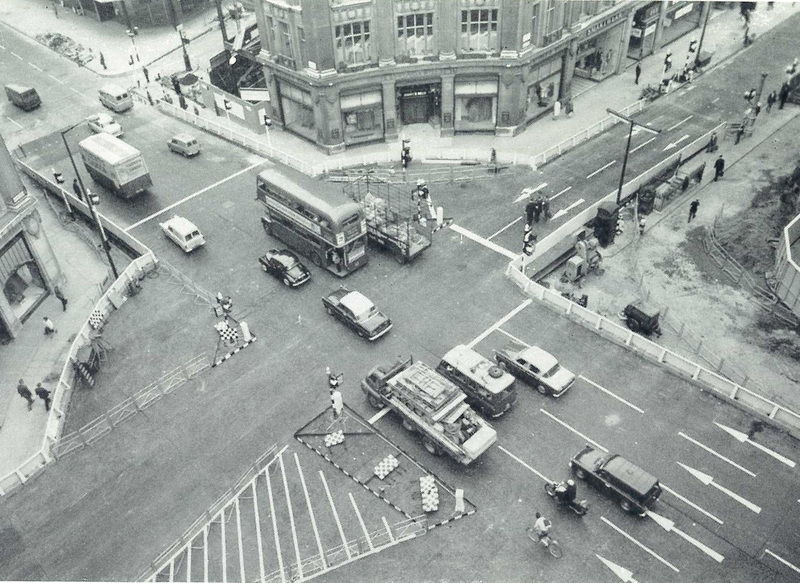 For these reasons London Transport had to find a novel way to work that would allow both the station and road junction above to remain fully operational while construction began on the required new elements below the surface. How to keep one of London’s busiest traffic junctions running smoothly while constructing a spacious new Underground ticket hall inches beneath it? 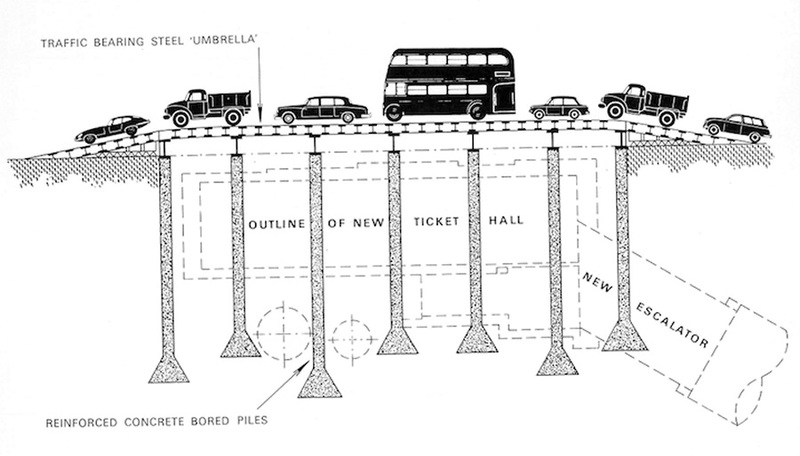 The answer was Operation Umbrella, a steel umbrella bridge that would carry road traffic and allow construction of the new Underground ticket hall below it. Operation Umbrella was implemented on the August Bank Holiday weekend of 1963. Oxford Circus and adjacent streets were closed from early afternoon on Saturday until 6.30am on Tuesday 6th August. The Oxford Circus umbrella was a platform roughly a metre above the road surface. Ramps from all four directions lifted road traffic to the raised junction. The deck was assembled from prefabricated steel sections supported by a steel framework that itself rested on 25 concrete foundation piles. 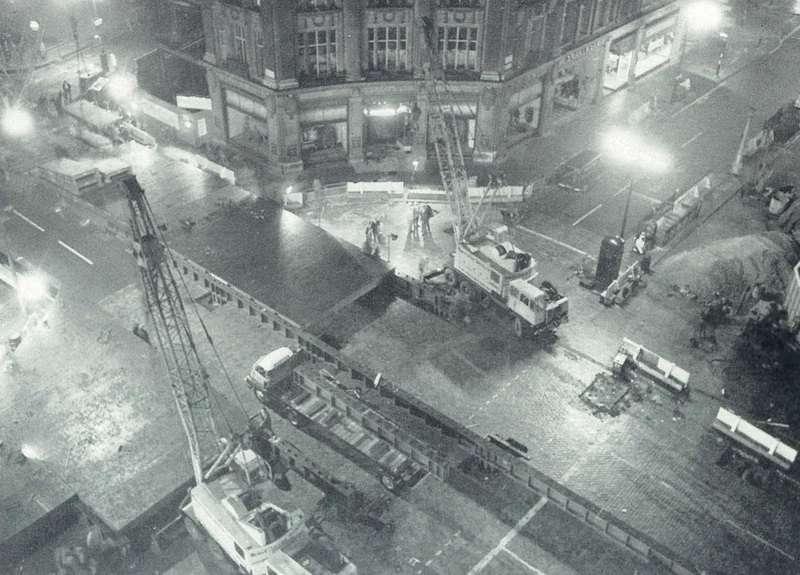 The foundations for the umbrella were installed around Oxford Circus under the cover of night, over 18 nights ahead of the 1963 August Bank Holiday. These foundations had to be threaded through a maze of cables, gas mains, water pipes and sewers – missing some of them by as little as an inch. The foundations the umbrella rested on were 25 concrete cylinders with a bell-shaped footing in the clay ground. The cylinders were made by drilling holes, one-metre in diameter and up to 15 metres deep, then lining the holes with a steel pipe, and finally filling the pipe with concrete. A steel framework was constructed upon the concrete foundations. It would hold the prefabricated steel sections in place to created a continuous bridge for road traffic to travel over. The Operation Umbrella team took over Oxford Circus at 1.30pm sharp on the August Bank Holiday Saturday and over the course of the afternoon the steel framework was put in place. At 7pm that night, the night shift took over and started putting the first decking sections into place. In total, 254 sections, weighing over six hundred tonnes, were fitted. On average it took the team just eleven minutes to put each decking section into place. The whole structure was designed to interlock and thereby stay in position. 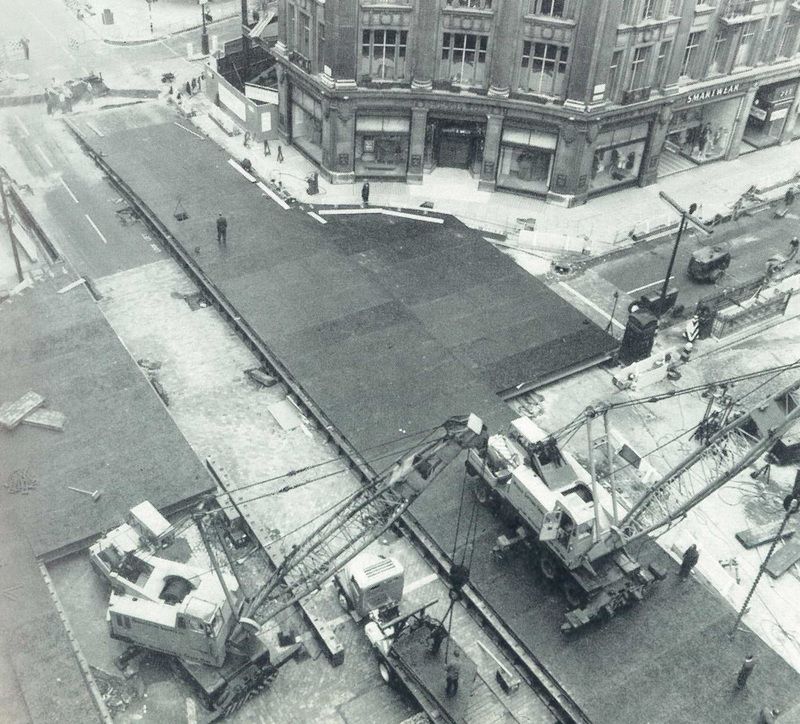 Once the decking was bolted down the asphalt was laid. Right on schedule the site was ready for regular traffic to resume at 6.30am on Tuesday August 6th 1963, after the August Bank Holiday. With the umbrella in place the new ticket hall and the upper escalators were excavated. Materials were delivered to the working site over night by removing decking pales and lowering them through the holes in the decking. This decking was then replaced to allow normal traffic to resume in the morning. The new ticket hall ceiling would be only around 75cm below the road surface. Utilities crisscrossed where the new station would be were rerouted. Once the new ticket hall roof was completed the load of the roadway above was transferred from the ‘umbrella’ to the new ticket roof. To add to the complexity and difficulty of reconstructing the station, the new southbound Victoria Line station tunnel passed just under the large Peter Robinson department store at Oxford Circus with its three basements and its foundations. It was necessary to spread some of the building’s load before tunnelling began. 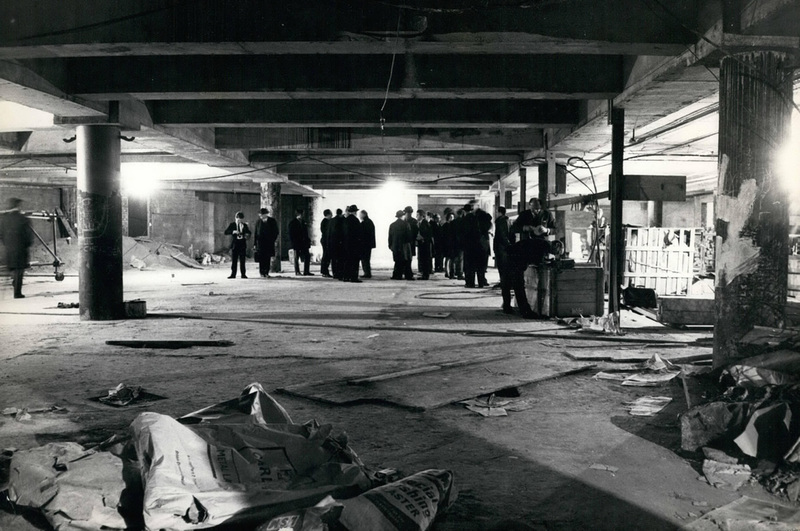 From the working shaft at Cavendish Square, a 230m access tunnel was dug to beneath the department store. 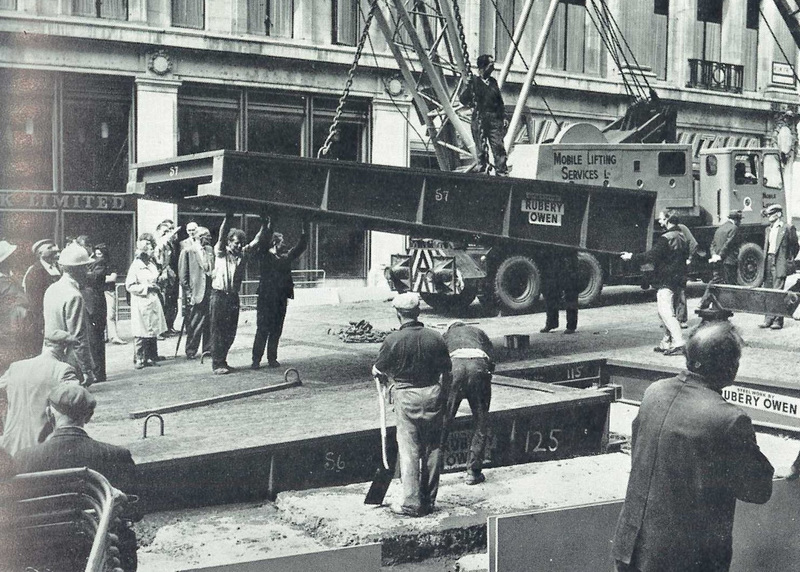 A pre-stressed concrete raft was then constructed below the basement to spread the load. The under-side of this raft was formed of weak concrete as the new southbound tunnel would cut across the underside of the raft itself. At Oxford Circus, as all stations along the Victoria Line and sections with difficult ground conditions, miners in tunnelling shields cut the clay with power-driven hand tools. In November 1965 the station tunnel shield came into contact with the curved underside of that raft. Work had progressed smoothly enough that the miners had only to skim off the very bottom of it. The new 7m in diameter station was then fitted with specially reinforced steel tunnel rings that could bear the load of the department store and its basements above. Three years later, on the August Bank Holiday 1966, the umbrella was extended 30m eastwards along Oxford Street to enable the construction of a subway linking the existing ticket hall to the new one. After nearly five years of service, the ‘Oxford Circus’ Umbrella was dismantled by a team of civil engineers on Easter Bank Holiday weekend in 1968. Operation Umbrella had been completed. The Victoria Line itself opened in stages. Without ceremony services between Walthamstow and Highbury & Islington started mid-afternoon on the 1 September. On 1 December 1968, services extended to Warren Street station in Central London. Finally, the Victoria Line was officially opened on 7 March 1969 by the reigning monarch Queen Elizabeth II, opening to the public at 3pm that afternoon. The extension to Brixton was signed off in 1967 and opened in 1971. Pimlico, a late addition to the line and the only station without any interchange, was opened in 1972, completing the Victoria Line route as we still know it today. Has Aug bank holiday moved? I was a teenager in those days and the umbrella was a feature when I made my first trips to central London on my own, and experienced travelling over it on the original Red Arrow route which went from Victoria and in a loop via Grosvenor Square, Oxford Circus and Marble Arch. You don’t mention it but there was also an access shaft from Cavandish Square to the platform workings. This found a useful purpose for an equipment room when the line was upgraded. The Victoria Line: A Pictorial Record … my copy ( Yes, an original ) is behind me right now …. The bit of the construction I remember very well was the forest of ice-&-frost covered pipes by Tottenham Hale, even on the hottest summer days. This was to solidify the ground in that area, which could best be described as a slurry of gravel, sand & clay. Yes, it used to be at the “front” rather than the “back” of the month …. @DJL yes it has. It used to be the first Monday in August until the late 60s or 1970ish. Probably at about the same time, the Late Spring Bank Holiday (also known as Whitsun) was fixed as the last Monday in May, rather than moving in conjunction with Easter as it would have done as a (Christian) religious festival. I think this was a year or two before the first Monday in May was declared a Bank Holiday in the mid 1970s. It says here https://www.learnenglish.de/culture/bankholidays.html that the August Bank Holiday in England, Wales and Northern Ireland was changed to the end of the month “From 1965”. The late spring holiday was fixed at the end of May, rather Whit Monday, at the same time. But not all promoted as such. Blackhorse Road was not originally shown as an interchange on tube maps and the Victoria Line in-car diagrams. It was only after the internal LT Road-Rail Coordination Committee had a site visit there in 1969, after the line had opened at Blackhorse Road in 1968, that it was agreed to shown the neighbouring BR station. This led to the inevitable paper stickers on the in-car diagrams! They seemed a bit more purposeful and less bureaucratic in the London Transport days. I wonder if any of the managers back then got salaries in the region of the half-millions they seem to get now? I doubt it very much. Where did it all go wrong? @Alex: “Where did it all go wrong?” When reality started to become a bit pear shaped. People’s perception of money changed and ultimately greed was not something to be coughed at. Fabulous article, thank you v much Nicola B! Takes longer today with TfL/Crossrail/NetworkRail/MTR/Councils/DfT all managing work on the same project site. It’s also true that modern safety standards are higher, which affects how quickly many jobs can be done. And while some people may rail against “health and safety gone mad”, in the construction industry it really does bear fruit in terms of the number of serious injuries & deaths resulting. In my book it’s worth it. Extraordinary as this project was, London Transport had good experience of such complex operations from major upgrades between the wars and during the 1950s. Probably the most complicated was making the Aldgate triangle larger, so longer trains could be run without blocking the junctions. That involved building a new Aldgate East station further east, requiring the track bed to be lowered and the tunnel widened, while continuing to support Whitechapel High Street, complete with trams, only foot or two above. Almost all the work was done at night between normal traffic hours. It appears that the only blockade was for the weekend of 29/30 October 1938, when the new track layout was brought into use. It is likely that some of those involved in the rebuilding of Oxford Circus, particularly at the planning and design stage, would have had experience of the Aldgate scheme, if only at a junior level, and of other projects to extend sub-surface stations on the District Line. FOUR lanes westbound on Oxford Street and two southbound on Regent Street. The return paths must have affected the area. Possibly making everyone wear safety equipment all the time is less hassle for management than tailoring it to the job? Completely understand, but that doesn’t make it right! Thanks for the article. I knew about this being done, but one thing I have not seen explained: where was the access to get underneath to do the digging? I don’t know what salaries were for LT management in the 1960s, but when Lord Ashfield was head of the Combine he was paid £15,000 a year which is about £1 million in today’s money*, and Frank Pick got £10,000, so I wouldn’t assume management today are paid vastly more than in the past. * And would have gone much further in the London property market than an equivalent amount today. @Herned – where was the access? If you look at the newsreels for Regent Street views you can see construction equipment cordoned off alongside Peter Robinson (Top Shop), possibly south of the bridge too. There is room for more than the two traffic lanes used. Follow up question – what is holding the roof afterwards and the road traffic? Did they bore more pilings to a lower height (using their best guessing method) at the same time as the umbrella, or did they wait until excavating the whole chamber and then assemble a drill below? Also I had believed that Hi-Viz evolved from the black-out in WW2 but apparently it was an American Bob Switzer who developed a fluorescent paint in the 1930s. The traffic policeman’s white cuffs were the cutting edge of safety in London at this time, although BR began testing orange jackets in Glasgow in 1964. Fascinating article – thanks very much. I always enjoy descriptions of how the infrastructure we now take for granted was built, and the challenges faced by the engineers who built it. Great article and an interesting piece of engineering. But perhaps it’s the things that get shaken out of these discussions such as the change of the date of the bank holiday in August that surprised me the most ! For those who might not know on which corner the Peter Robinson stood..nowadays it is known as Niketown and Topshop/Topman/Miss Selfridge. The Topshop brand was started by Peter Robinson store as their youth fasion own brand and ultimately was the survivor of the department store. The store took a direct bomb hit in WW2 (knocking the Oxford circus corner down) but was repaired to match the original building (now listed) within a few years of the end of the war. Fortunately the grand tea room complete with vaulted ceilings with murals of operas wasnt damaged too much. The tea room space has been offices for many years but my be open to the public again in the future. Scotland and the Republic of Ireland have retained the 1st Monday in August as they reckoned the weather was better then that at the end of the month. I can’t see TfL doing something similar nowadays, they’d just shut the road and divert the traffic! As an aside it’s surprising how little that section of Oxford Street has changed, when you consider how much has been rebuilt in recent years. In the top photo, the 2 modernist buildings, one which used to house BHS, the next John Lewis are still recognisable. The school summer holiday in Scotland runs from the end of June to mid-August, so having the bank holiday at the end of August would break into the new term. However, most companies and people observe their local Fair Holiday rather than the bank holiday. Glasgow Fair, in the middle of July, was traditionally the busiest time for holiday traffic on the railway and the Clyde steamers. It would be interesting to know how the entire one way system was arranged, not least with eastbound buses in mind. The apparent need for four lanes westbound is interesting, but couldn’t easily have been reciprocated in the opposite direction. Re TfL just shutting the roads nowadays … didn’t they build a bridge very similar to this when building the new Kings X St Pancras ticket hall under the Euston Rd? In the diagram of the umbrella I’ve identified the E Type Jag, what looks like the Queen going to Selfridges, the obligatory Routemaster (that appears to be flying slightly … hit the ramp too fast maybe? ), what I think might be a Hillman Imp, and a brace of what appear to be Bedford S type trucks. The last car I’m struggling with, think it might be a Saab? Triva corner: a Bentley, not an RR, so probably an ambassador or rich kid & yes, the last is definitely an old SAAB estate ….. I thought the small car looked like a Triumph Herald, but I think you’re right, it’s an Imp. The bus, though, is not a Routemaster – it’s an RT. Yes I saw that about moving panels at night, but surely there must have been a more permanent access for removing spoil etc? Or was everything done at night at first, so lift a panel or two, dig out as much as possible in before morning and then replace the road? I notice that in the aerial shots of Oxford Circus it looks like one of the four buildings at the top right corner had been demolished for the works. Does anyone have any information on which corner it was, and whether it was demolished and rebuilt identically for the purposes of this umbrella? The photographs show an open space with builders hoardings on what I think is the NW (Peter Robinson) corner of the junction (on the right in the photos). But the articles suggest the main access shaft was in Cavendish Square, and most digging under the Circus itself was upwards. As mentioned above the Peter Robinson building had already been rebuilt following Blitz damage. The BBC film shows a small worksite in front of it. The Umbrella idea was next used at Bond Street station for similar reasons mid 1970s when Fleet Line was in hand (later renamed Jubilee Line). Tottenham Court Road (1907 station) and Marble Arch (1930s) also have ticket halls under road, but not sure how this was done. All roofs very close to road surface. One reason why TfL not enthusiastic about trams along Oxford Street as clearances not adequate. I well remember the Oxford Circus Umbrella though. Made crossing the road quite interesting. At that time the station had a police-controlled queuing system to get in in evening peak and I think in addition to the five escalators were still using the 1940s lifts that had two top landings, street level for exit only into Argyle Street and a booking hall stop for entry. If service was unwell people had to be held back at street level because booking hall and low level passages could not cope. Reconstruction was needed even pre-war but always postponed because the new line (later Route C and later still Victoria Line) would fix it, but was constantly delayed so station became a nightmare. Part of cost justification for new line is that Oxford Circus would have to be rebuilt anyway, and that would not be cheap. I am curious – when were the concrete bores poured – during the weekend or before? Concrete piles were poured during nights and weekends prior to the umbrella being erected. The network loadings are much higher these days so interchanges need to be able to absorb more passengers especially to deal with slightly hiccups in service on one line. Hence more space is needed and the sensible way to achieve this is using distance as it also enables flow to be safely regulated. The capacity of crossrail trains is just under double the average tube train. hence the need to even out the flow. The crossrail interchange timings also include assumptions about not being able to board the first tube train due to passenger loading already on the train and waiting to board the first direct service when there are multiple branches. The opportunity of constructing easy interchange are mostly long gone in Zone 1. As a recent convert to the District Line, it is apparent that this can be a real problem on multi-branch lines. There may be another three trains within the next five minutes, but people are still going to want to squeeze on to the first train if none of the others are going to their destination. Conversely, short distance passengers are ill-disposed to let the first train go because waiting for the next is a more significant increase in their journey time. The District tends to be the worst for getting on the first train even if going to the wrong branch especially as there extra trains to the western branches (especially Wimbledon) at Earls Court from High Street Ken / Edgware Road) , the trains can be re-destinationed at Earl Court and the District is a bit more flaky than some routes so nearer you destination if it goes wrong! In contrast passengers will generally wait for the right Northern branch train on the Northern line at most stations though. Indeed so, but when the first train is actually going where you want and you can’t get on it is very frustrating. Richmond gets (in theory at least) a train every ten minutes. On CrossLiz, there will only be a Reading train every thirty! So, it didn’t take long to go off topic. There is an excellent chapter about this in The Story of The Victoria Line by John R Day. A bit old but still well worth a read if you can get a copy. Mike Horne is too modest to mention another fascinating article about rebuilding Oxford Circus. The Story of A Station – Oxford Circus. I can’t remember where I read it or saw it but the umbrella installation nearly all went to plan except for removing the cobblestones at the extremities of the umbrella. The schedule allow for 15 minutes to remove them. It actually took a considerable number of hours so firmly were they embedded. A similar problem occurred a few years ago at St Johns where the most difficult part of doubling the flydown was removing the existing bridge. Construction times can usually be accurately predicted especially if a dry-run in advance is carried out – as was the case at Oxford Circus. Demolition times can only be an educated guess. They were very lucky with the same level interchange at Oxford Circus. Tube platforms are normally built with the platforms on the inside between the lines. On the Bakerloo at Oxford Circus they were built on the outside which meant that the could provide same-level interchange without having to repurpose an existing platform and divert an existing line to achieve it. It was opened from first trains, as one of many who made it can vouch! My memory is of travelling earlier than mid-afternoon. My disappointment of the day was deciding to buy a ticket to get one dated for the first day of operation(I already had a Twin-Rover ticket for travelling). I was given a British Rail rather than a London Transport one. The truth is the first train was at 07.32 am on Sunday 1st September. Nevertheless the other ‘truths’ prevail and we must see any true claims as a lie. One wonders who these others (the ‘railway professionals’) are then, making a nice living, flaunting their wealth, having their names up in big lights, TV appearances etc when they can get away with such untruths. Its not just politicians is it? The opening of the first section of the Victoria Line was in doubt only the day before, so no official opening could be planned. The new tunnels were so cold and damp that track circuits kept leaking to earth despite large gas-fueled fan heaters on platforms. At a late stage it was decided to lift each rail chair and put insulation beneath. Overnight trials must have provided clearance for the public opening. I set my alarm clock early to walk to a nearby phone box to check with ABBey 1234, the 24/7 LT information service, and then made my way to Walthamstow by early morning BR trains. There was a small gathering of mainly young enthusiasts, many from 55 Broadway, to meet the first train. What a change between the cool, damp atmosphere of the new Victoria Line tunnels and today’s tunnels. And all it took was fifty years of waste heat from train and human sources. Don’t forget that construction required freezing of ground in some locations. It didn’t take fifty years. Probably more like 50 days. The problem righted itself very quickly. The ambient temperature only had to get above the dew point – not hard with the waste heat from the train and human sources, which you point out. The continual movement of the trains once the line was open would have very quickly mitigated against any cold spots.